When I wrote about overspeed training, I was referencing sprinters. Bt what about long jump? Or, better yet, pole vault? For long jump, that’s an easy fix. We use a simple raised wooden box because the purpose of the long jump is to jump as high as you can with the addition of the horizontal speed of sprinting. Coupled that with a take-off of 45 degrees (or better yet, 42 degrees) and you’ll achieve the parabolic arc for the maximum horizontal distance. It’s just physics. Just keep the proportions realistic and not pretend to do a 9 meter or 30 foot long jump. Keep your head on your shoulders! Of course, people always take my advice and try to do more with the “if a little bit helps, then a lot will help more” attitude. It’s just human nature, but not always common sense. Then again, we don’t want this kind of scenario! Ouch! 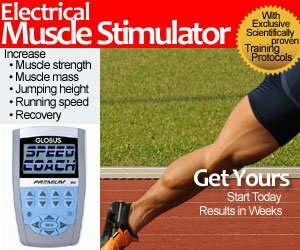 How do you achieve high horizontal sprinting speeds without taxing the CNS (central nervous system), or if you have limited facilities? Remember, you want to work on jumping technique, not top end speed. Enter the French Pole Vaulters. 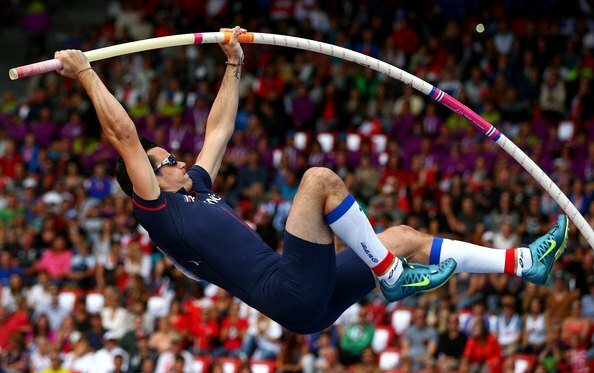 When you think of French pole vaulters, you probably think of Renaud Lavillenie. When I think of French pole vaulters, you probably think of Thierry Vigneron or Pierre Quinon. Just like I think of Pierre Jean Vazel when I think of French Sprint coaches. Enter Kevin Menaldo, stage left. He posted on his Facebook Page how he used a ramp to achieve a faster, but shorter, approach run. This is quite innovative, and given the space restrictions of indoor track and field stadiums and facilities, it’s makes sense. Take a look, and see for yourself. Post by Kevin Menaldo – Officiel.